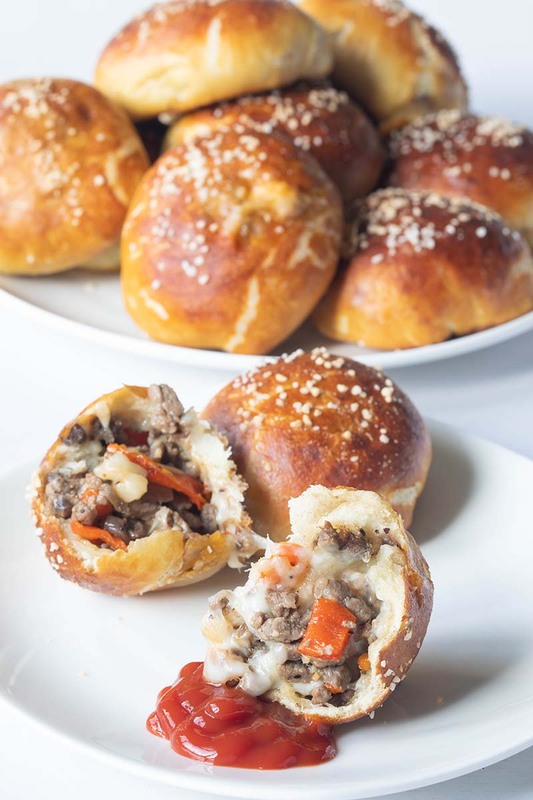 All the amazing flavors of a classic Philly Cheesesteak stuffed in a soft ‘n chewy pretzel bun! This will quickly become your favorite game day or party snack! Add in the flour and salt and mix on low just until loosely combined, gently scraping down the sides. Mix until a soft, smooth elastic ball forms, about 8-10 minutes. The dough should pull away from the sides (though it may not be fully pull away) of the bowl but still be wet/tacky to the touch. Remove the dough from the bowl and place on a very lightly floured surface, give it a few kneads by hand. Place in a lightly oiled bowl (at least 2-3 times bigger than the ball) and cover with plastic wrap. Allow to rise until doubled in size; about 60-90 minutes. In a large skillet over medium-high heat add in 1 tablespoon of oil. When the oil begins to shimmer add in the onions and peppers. After a minute add half of the salt, pepper and garlic powder. Stir to combine. Cook until softened, about 6-8 minutes. Remove to a bowl. In the same skillet add the remaining tablespoon of oil. Season the steak with the rest of the salt, pepper and garlic powder. Gently mix. Add the meat to the skillet and cook just until no longer pink, about 2-3 minutes. Add back in the onions and peppers. Stir to combine and remove the pan from the heat and set aside. Turn the dough out onto a lightly floured board. Cut into 12 even pieces. Gently form into a ball and then pat each ball out into 5x3-inch rectangle. To the center of the rectangle, add some of the meat mixture and then top with a chunk of each piece of cheese. Fold up the bottom, then each side and then roll to close. Pinch the seams closed. *Make sure that the dough is not patted too thin as the mixture will leak out. Preheat the oven to 425°F, rack in the middle. In a large pot add the 6 quarts of water. Bring to a rolling boil and add in the baking soda. Brush the bombs with the egg mixture and sprinkle pretzel salt. Recipe created by The Kitchen Whisperer. For the pretzels: Do not use iodized or even kosher salt for pretzel salt. The granules are smaller and they often melt or tend to get too salty. For the steak: Freeze the meat for at least 30 minutes to an hour. You don’t want the meat soft but you also don’t want it rock hard. What you want to is have it be firm enough that you can slice it thinly with a knife. Philly Steak sandwiches do not have huge chunks of meat but almost shaved-like slices. You can ask your butcher if they will shave it for you but some may not be able to. Once you slice it thin, turn the pieces a quarter turn and chop it. You really want to chop up the meat as it will be easier to cook. Most sandwich shops that serve this already buy their meat that is so thinly shaved that as soon as it cooks it starts to fall apart with the slightest touch.